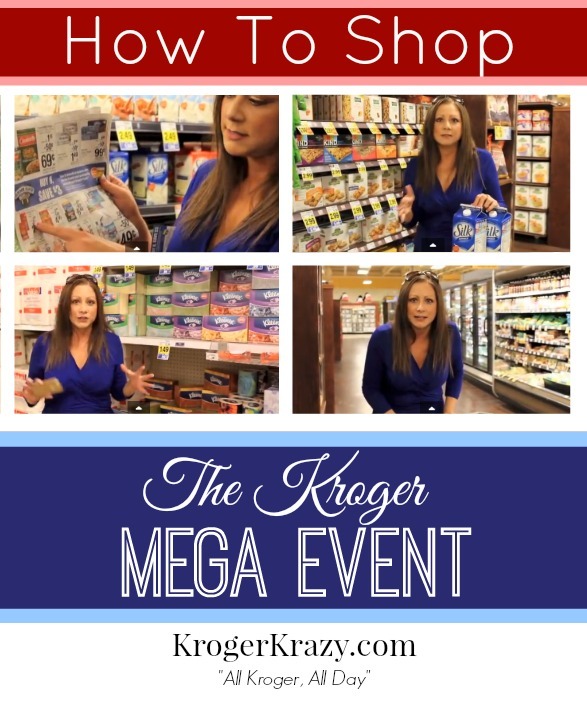 A mega event is a promotion that Kroger does several times a year. Unlike typical 10 for $10 sales, you MUST purchase the quantity of items specified in that particular promo in order to receive the mega sale discount. For example, “Buy 10 participating items, Get $5 off instantly”. 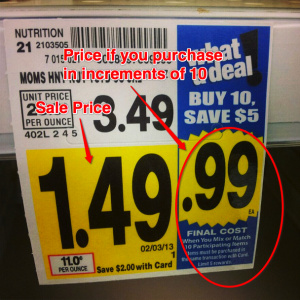 You must purchase in increments of 10 in order to receive the additional $0.50 off per item. You can mix and match these items and receive the discount as long as you purchase in multiples of 10 in the same transaction. Here is an example of a mega event sale tag. Notice there is a “sale price” of $1.49, and then a 2nd price of $0.99 if you purchase 10 participating items. 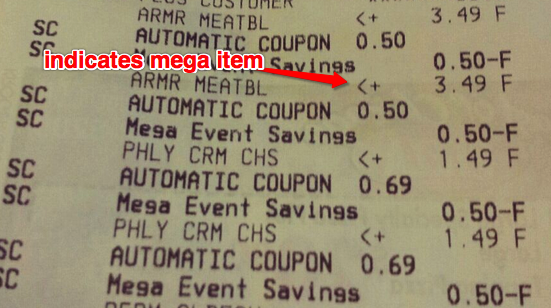 The mega discount will come off immediately at checkout when the item is scanned. Typically you will see a participating item marked on the receipt with a < + symbol. Not all participating mega sale items will be advertised in the sale ad. There are almost always tons more items that will just be identified by in-store signage, so be on the lookout for those mega sale tags! Sometimes there are limits to how many mega items you can purchase in the same transaction, sometimes not. 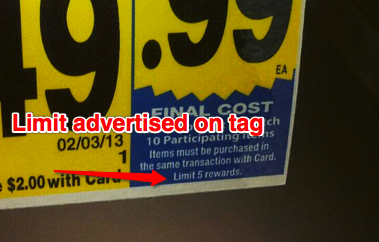 If no limit is advertised in the ad or on the sale tags, you may want to ask before you start shopping. If the limit is 5 rewards, that means you can purchase 50 items (if it’s a buy 10, save $5 sale). If you want to purchase more than that, you’ll need to separate your transactions (if permitted) or just come back another day. You are awesome! And funny! Love the last picture!!! Thank you for the tip! My first Mega shop (the other day), I had everything laid out on the pharmacy counter.... counting. (pharm was closed) My Kroger was out of a lot of things on my perfectly laid out list, so I had to regroup. This will work a LOT better. Thank you for all you do! Thank you for all the work you put into making Krogering a fun and money saving experience! Your explanations were so thorough and easy to understand. From all us novices out there, thank you for answering our questions. And I'm so doing the bag method today. I was trying to figure out how I'd keep my counts straight while making sure the babes were happy too :) Thanks again! Thanks so much for taking the time and putting this together for us! Thank you for the tips and for all the work you do. I LOVE your site! Mega sales take a little more work but are so worth it. My husband usually goes with me shopping to help, and he has strict orders "no Megas go in the cart without letting me know". First I make a list with how many of each I"m buying, put the corresponding coupons in an envelope. When I put a Mega item in my cart I put a hash mark line on the envelope. When I get to 10 I circle it. Usually works pretty well. I hate when they run out of something I have on my list, kind of messes me up, but I usually have "fillers" planned to make up the difference. If you are like me and feel like people think you are stealing everything you put in your reusable bag as you shop, just grab a couple of the little hand carry baskets and put them into your cart and off you go. Easy at the checkout because you can set the whole carry basket on the checkout counter. I love this web site and have made my co-workers coupon believers!! Maybe you could add a follow up post to this regarding how you handle things when shelves have been cleared, getting rainchecks, etc. Thanks everyone for your positive comments! :) Susan, great idea! Somebody asked me about rainchecks the other day, so great point to add to this post. Love love love your site and matchups!!! A HUGE thank you to you and everyone who works with you to get all of these together! One thing I've done for this event and others (Meijer does a buy 10 get the 11th item free sale) is to use a few of the store's shopping baskets in the cart. I've put 2 baskets on the rack under the cart as well as on top in the seat to help keep things together and/or separated. Love your site! I check your site several times a day during a mega sale! I purchased 20 mega items. Looking at my receipt I only had 1 $5 reward. I took the receipt up to cust service and we noticed that one of my items was on manager's special (Wholly Salsa). Once they saw that Wholly Salsa was on the mega sale - they gave me the $5 reward. Make sure you get your reward if some of your items are on manager special! You have helped me out a lot since I shop those Mega sales at Kroger. My daughter pointed me to your sight and I love it. 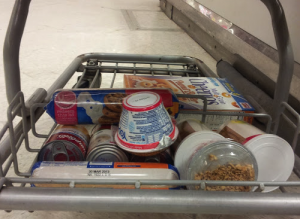 Thank you for getting it together for us all and the basket in the cart is a great idea for 10 items. You just crack me up! Comical! Love it! I love your site I used to check like six diff ones as a young family of five moneys tight so ur site is the only one I use anymore you have saved my family not only a lot of money but also a lot of stress!!!!! Great ideas! You are awesome and I tell everyone about your site! You have saved us so much money! By the way I'm usually down the aisle recounting everything before I check out. Too funny! I also do as Penny suggested and use the hand carry baskets. I normally put on in the cart and one under the cart. I use the one on the bottom for my non-mega event stuff. Although it can be a little time consuming, sometimes it is easiest to do seperate transactions, never buying more than 20 Mega-items at a time. It allows for better price checking. And with the new Catalina's would allow you to roll them for a lower OOP. I like Penny's suggestion to use baskets better. 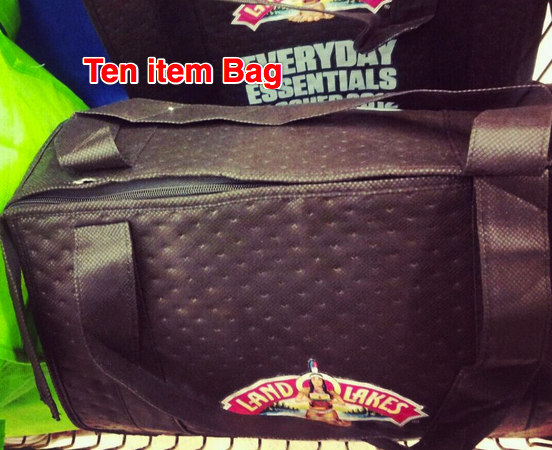 Even my husband commented that it is not OK to bag items that have not been purchased yet, especially zipping them. If you don't have your reuseable shopping bags with you...you can always use several of those black hand baskets to keep track of things. I also use one on the bottom of the cart for non mega items too. It's a lot easier unloading the cart that way. THANK YOU! 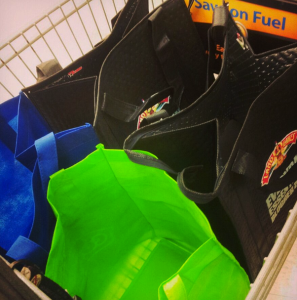 I love the tip about using your reusable bags to keep track of your mega items! I always have used the tally system, but I always miscount somehow! Last time, I got to the car and looked at my reciept and realized what I had done, so in 18degree weather, I went back in and grabbed my 2 items, and walked back out of the store with $7 in my hand! So glad I noticed it! I will be using my reusable bags from now on! Thank you so much for explaining this again for me. The first time I went and bought 14 items, I couldn't understand what went wrong. I call the the store and a very sweet customer service lady explained it to me. Lesson learned. 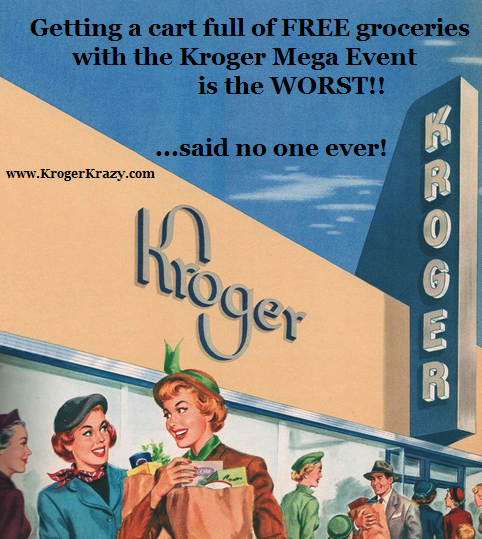 I am excited when we have a Kroger Mega Event. I found you about a month ago and wow, am I glad I did. Happy shopping. thanks for the tip with the shopping bags! i'm always the lady in the cereal aisle counting boxes of cereal to get free milk or sorting through my groceries making sure i have enough items. i'm always terrified i will get to the checkout with not enough items LOL! i have 20 grocery bags, so i will use that technique now! thanks!! Atlanta: I'm cracking up over here - this is BY FAR the best write up I've seen re: Mega Event Sales...my fave? "No more hiding in the last aisle at Kroger counting 50 items!". I laughed because I've done it a time too many! Never thought about bagging the items as I go, nor the non-mega at bottom of cart. Thanks for the clever tips, I especially love the mEgA grin at the end! The intensity may feel merely like taking a walk, or it could feel like caught a track. Dieting and fat loss have the potential to become miserable experience, but it doesn't necessarily need to be the case. Just like there are different types of shoes for each dance you will find typically a variety of dress that go along with each style. On another hand, to the average Joe whose reputation online is mostly so he (or she) can land a better job, this SEO spamming is not likely to cause problems and might actually help. Now there's two possibilities that can harm your interest here. After monitoring all of the possible information, you may realize one thing. This is simply because a business helps make enemies whether it manages to have got type of success at all. A blog can be another great way to have complete treatments for your message. What a great post! My sister has been bugging me to teach her how to coupon...This is a perfect teaching tool! Thank you for all you do! Thanks so much for all you do. I know how how much time it saves me and I realize the time you must spend to make us so happy!! I'd tried the 10 items in the bag and it worked great! Thank you so much for the tip. I will continue to use. Thanks so much for the tips! These ideals will make my Mega shopping event much simplier. I've only done it maybe 3 times an I am one of those whom counts my selection 10 times to make sure I got the correct amount. Hahah! Makes me feel better to know I'm not the only one whom struggles keeping my number straight. Love your website just found it a few days ago an I am learning new tips already Thanks for sharing!!!!! 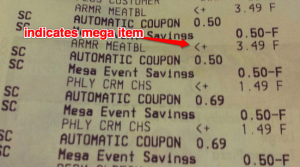 This may be a dumb question but can you use coupons with the mega sale items? This is awesome so many people need to see hands on how to do it!!!! I love the time and effort you put fourth and want to thank you. Awesome! Loved your video! My favorite Kroger site! I never really shopped much at Kroger, after watching your videos and saving 71% on items in the mega sale I am now a Kroger shopper! Even though I could not get some of your posted sale items because of different prices. Thank you! Love your page! I always have an item in mind that I can add to my total just in case I have miscounted my mega sale items. That way I can just tell the cashier to add on how ever many I need to make my total right. Thanks for all you do! I like your idea of the reusable bags to keep track o your items. I always grab a handheld shopping basket and put it in my buggy. I put the mega event items in the basket until I get the number I need for the sale (usually 10). Once I get the number needed I just empty it into the buggy. The great thing about this method is the baskets are available at the store if you forget your reusable bags. My kroger has the carts that have a little shelf/basket on the cart. I think it is to put things you don't want smashed. I use this as my counter. All mega sale items go in there. When I get to 6/10 whatever the magic number is, those items go down into the main cart. Since I started this, I've not miscounted. I got 155.00 worth of groceries,laundry detergent,and razors for 72 bucks! Mega Sales are great! Went last night and my total was $220.36, but only paid $118.12 for a savings of 46%. I live in Indiana and I have a problem with the difference in prices from one region to the next. I know that competition has a lot to do with it, but I sometime feel like we are paying a higher price so others can get a better deal. For example you had Kleenex for $.99. They were $1.19 at our store. Sometimes there will be a difference of as mush as $.50 difference in the prices. The idea of using the hand basket to keep count is great. I will be using it the next time. Your site is best and has saved us lots of money. Be proud of all you do to help us save each week. 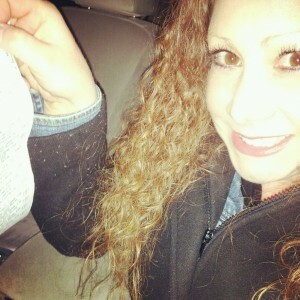 I get the same look when I do the most due deals...that is after using my Coupons! This is so awesome thanks ... Ur hilarious too. I picked up $301.17 worth of groceries and only paid $158.89. I love Mega events, these are stock up prices. This mega event is great! I have a family of 6, so this goes along way!!! I don't use the bag system, I just update my number on my note pad each time I add a participating item. Works great for me. Also this total includeing non mega event items like Beef that was on sale, so I think I did awesome! Totally love the "Bag Idea!" If I had a nickle for every time I was in Kroger's and hiding in an aisle to recount my things, I'd have a jar full of nickles! Ha! Thanks again for the tip - I will be using it on future trips to Kroger! I AM that woman standing in the greeting card aisle counting and recounting her mega event items LOL! I got snowed out from doing any mega event shopping today. :( I will be taking the reusable shopping bags with me this week. I should be able to cut 15 minutes off my shopping trip. :) Love your site. Thanks. After years of heckling me about using coupons for everything, my kids were transfixed by your presentation. They want to know who your cinematographer is. Me too Kim! Don't you know I forgot my bags this week, and had 90sh items. Thankfully I didn't have the kids. That's my suggestion - leave kids at grandmas house lol. The bags works every time! I had to buy additional usable bags when I got the Kroger because I forgot some. They are $.99. Good investment. Also, while I was checking out I saw the "All You" magazine on sale at Kroger. I think they are branching out to other stores. I also noticed they sale them at Meijer. I would like to know if the magazine is sold in your stores. Katie, keep the videos coming. It was a very BIG help. Thank you again for your matchups. Love the video, very helpful!! Katie-- I am kinda new to couponing and do not have a binder or envelopes yet (Have a little box, but haven't quite figured out my method of separating coupons i'm using versus one's i've decided not to use. I usually put the coupon with the item in the cart, that way when i put it on the belt at checkout, i grab the coupon and make a stack to hand to the cashier. with that said--you'll appreciate the following story-- i was buying the Angel soft a couple weeks ago for super cheap and I had put them on the bottom shelf of my cart, and because of my afroementioned method (coupon with item), the coupons were inbetween the packs of TP on the bottom of the cart. at some point during my shopping trip the coupons fell off my cart. i was walking through the aisles for 10 minutes trying to find my coupons. ACK!!! found them though, just sitting there, just like you camera case. Love the Mega Sales- thank you for the bag trick I lose my cool a lot counting every time- now I have a way to control it.yay!!! Thanks Katie! I enjoyed watching your video this morning @ 4 am! Good way to start a very early morning...a few giggles, learned a few things and was able to see how much you save. PS Ive never bought Silk milk but I am going to try it for that price! I keep track of my Mega-Items on my grocery list. If I take 6 granola bars, I write number 6 next to that item and circle it. Then when I am done, I count everything that is circled and make sure I am in the correct multiples and add filler items if needed. It would be difficult for me to bag everything in my cart because sometimes my cart is overflowing! (I know, you're thinking I'm a mustard hoarder haha!) And I don't have to worry about mixing my non-mega items with my sale items. I have read where the prices in stores differ in each city/area b/c they base it on population. I have been told that at retail jobs I had also. So, I am a little confused on the mega event. I am going to get the old spice spray. I have the paper coupon and the digital coupon, if I were to get 4 of the sprays, would I just use my digital coupon and my paper coupon and that get me 4/5 of the mega event items? TIA! Forgive me if this is a stupid question. Say I'm doing the mega event deal buy 6 save 3. To see what my total would be would I add the prices together and then subtract 3 from the total? Or do you not subtract the 3 dollars? I LIVE IN THE HOOD AND IF I TUCK ANYTHING IN SOME REUSABLE BAGS IN MY KROGERS, I WOULD HAVE CUFFS ON BEFORE I REACHED THE THIRD AISLE . . . . . . .
For every 6 items you buy that are included in the B6S3 sale you will add them up (if u want) and then subtract $3 from that - then at the end, add all ur totals up and thats what it would be before taxes. Example: Lucky Charms $1.99 when you buy 6 you save $3.00- $1.99 times 6= $11.94 minus the $3 you save for buying 6 boxes =$8.94 Kraft Singles $2.49 when you buy 6 you save $3.00 - $2.49 times 6=$14.94 minus the $3 you save for buying 6 kraft singles packs =$11.94 Now add the $11.94 plus $8.94= $20.88 plus tax for 6 boxes of cereal and 6 packs of cheese. Great break down! I actually understand now! So glad I found your blog! Thank you so much for the time and effort you put into finding all these amazing deals! I have been a stay home mom of 4 for the last two and a half years. Being able to save so much on our grocery trips has been such a blessing. With my youngest two in diapers and my oldest two having growth spurts every day, we have made some pretty pricy shopping trips. there's no way I could have found the time to find all the deals myself! I AM SO GREATFUL!! I'M SORRY, I DON'T GET IT.... DO I HAVE TO BUY THE SAME ITEM 10 DIFFERENT TIMES OR CAN I GET 10 DIFFERENT ITEMS???? You can buy 10 different items! DOES ANY BODY KNOWS HOW OFTEN ARE THE MEGA EVENTS? how do I know when the mega events are being held? and do all krogers do them at the same time or does each store do it at different times? new to this, how do you use ibotta? what bar code do you scan or take a picture of? and is it worth the hassle? Thanks so much for the video and all of the great information. I am getting ready to go mega event shopping, but I'm new to Kroger and have a quick question...if I load a digital coupon to my Kroger+ card, how many items will that coupon be applied to at checkout? Thanks so much! Does the mega event exclude clearance items? According to my receipt, I had a couple of cover girl eye shadow ring up as not part of the mega event sale.The manager told me some clearance items don't qualify for the mega event. I've not yet had this problem at any of the 3 smiths I usually shop at. The best thing for you to do if you do not have a binder yet is to get envelopes I think. If you Make a list of the things you want to buy and put the coupon in the envelope once then Its easier to keep track of. When you put the item(s) in your cart just highlight in yellow off the list and if they are out highlight in red what you didnt get. That way when you are at the register and she is scanning you can look through and take out the ones you did not buy. If that makes sense. Then I have a plastic file hold a small one that I keep all my envelopes in and they are separate by the store. Thank you so much. Kroger was always so overpriced for me, so I shopped generic stores. Missed name brand flavors!!! It's like BINGO--now I know how to play--save! I do Ibotta.. It takes a few minutes before you go & after you get home, but it's money back in your pocket ! I have a question. On the must do mega sales do I need to buy 5 of one item to get the best deal? I've been mixing and matching but on the ad match ups somethings wrong. Say Suave body wash deal. $1.99 on mega sale, used coupon and it said $.49 final price. I paid .99 and can't figure out why. I was thinking the same thing...I'm a woman of color and I'm not in the hood but I won't make it off the first aisle...Good idea tho. Thinking I'll just use a few of those lil red grab and go baskets. The mega sales have always been awesome!! I never had additonal coupons to go with the items. I like your video fun and informative. I agree! My Kroger shelves are always bear on Sale Items. Also, the Pharmacy needs some serious Management. You do not have to buy 5 of the same item. You can mix and match as long as it is one of the 5 off 5 deal. Sometimes it may not ring up right and you can let the cashier know. I always do mine in either 5 or ten items per transaction so i can make sure I am getting the right price. yes. Find out how many you need to get to do the catalina's. Meaning.. I just bought 5 Loreal advance hair items to get a 3.75 catalina for my next order. I used the catalina for that order to do the same exact transaction and got another catalina. I am not sure however how many times you can get these to print out. I just did the transaction two times per day. The catalina's will print out with however many you are suppose to buy to get it. I have heard that clearance items will not be included in the mega event, however i have never tested this myself. you take a picture of your entire reciept and most of the time it will have you scan the bar code on the item you purchased. Sometimes you will not know till the last minute unless you research different kroger related websites to give you the date. Kroger Krazy is a great one. where i am its normally once a month. So I recently moved to an area that has a Kroger that have these sales. So I'm new to this but when it says mix and match does that mean I can mix and match 10 different items of different prices? I absolutely loved be your advise. I can’t wsit to go to Kroger again this weekend. I have never had any lick finding the list of mega sale items. Ok, so I am just now beginning this couponing thing. 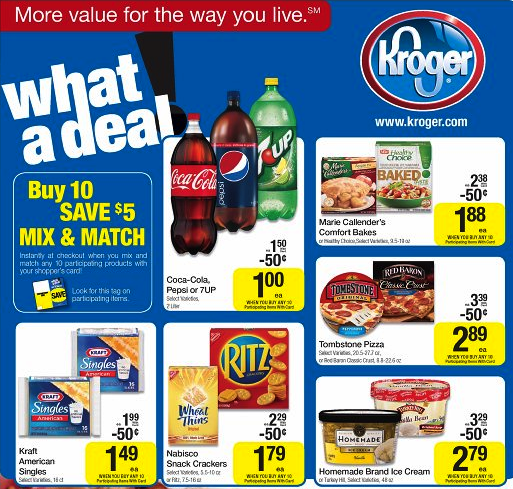 Question: Where (how) do you find your coupons to go along with Kroger's Mega events. For example, like you did with the Silk? Do you just happen upon them? Please, help me get started! Thanks! Thank you so much for this. I'm a beginner and still trying to figure it all out. I AM NOTA BEGINNER BUT I WILL TELL YOU ONE THING I LIKE THE OLD WAY BETTER. I THINK I WILL STSRT DOING ALL MY SHOPPING AT WALMART. I AM HANDICAPPED AN CAN NOT GET OUT TO SHOP BUT THIS REALLY FRUSTRATES ME ALOT AN I IMAGINE A LOT OF ELDERLY PEOPLE WILL SWITCH. I HAVE NO IDEA HOW TO EVEN GO ABOUT LOGGING IN AN I REALLY WANTED SOME THE MEAT BUYS YOU HAD. IF IT IS NOT EASY I CAN'T DO IT AN THIS ISN'T EASY AT ALL. Can I use coupons combined with buy 5 save $5 deals for more savings? I would like to join your group. How do I do that? Buy 5 save 5 and u can also use coupons? So can you use coupons on these items as well??? Abdul R. Virani: Can I use manufacturers coupons on top of the mega sales items.? On December 4, 2018 I was refused to accept manufactures coupon at Kroger 7000 Tim Price Way in Richmond VA on self service lane so I asked for manager . The employee and the manager both had very bad attitude. I can provide more details of the scenario if Kroger home office ask me directly. Can you use digital coupons along with the mega sale? I was told by the manager of my kroger that you can't use the two together.